If anyone asks me how I pray, my simple answer is that I pray the Jesus prayer. Anyone familiar with the story of a Russian pilgrim will know what I mean. It consists simply in repeating the words: “Lord Jesus Christ, Son of God, have mercy on me a sinner.” I have used this prayer now for over 40 years and it has become so familiar that it simply repeats itself. Whenever I am not otherwise occupied or thinking of something else it is almost mechanical, just quietly repeating itself, and other times it gathers strength and can become extremely powerful. I give it my own interpretation. When I say, “Lord Jesus Christ, Son of God”, I think of Jesus as the Word of God, embracing heaven and earth and revealing himself in different ways and under different forms to all humanity. I consider that this Word “enlightens everyone coming into the world”, and thought they may not recognise it, it is present to every human being in the depths of their soul. Beyond word and thought, beyond all signs and symbols, this Word is being secretly spoken in every heart in every place and at every time. People may be utterly ignorant of it or may choose to ignore it, but whenever or wherever anyone responds to truth or love or kindness, to the demand for justice, concern for others, care of those in need, they are responding to the voice of the Word. So also when anyone seeks truth or beauty in science, philosophy, poetry or art, they are responding to the inspiration of the Word. I believe that the Word took flesh in Jesus of Nazareth and in him we can find a personal form of the Word to whom we can pray and to whom we can relate in terms of love and intimacy, but I think that he makes himself known to others under different names and forms. What counts is not so much the name and the form as the response in the heart to the hidden mystery, which is present to each one of us in one way or another and awaits our response in faith and hope and love. When I say, “have mercy on me a sinner”, I unite myself with all human beings from the beginning of the world, who have experienced separation from God, or from the eternal truth. I realise that, as human beings, we are all separated from God, from the source of our being. We are wandering in a world of shadows, mistaking the outward appearance of people and things for reality. But at all times something is pressing us to reach out beyond the shadows, to face the reality, the truth, the inner meaning of our lives, and so to find God, or whatever name we give to the mystery which enfolds us. So I say the Jesus prayer, asking to be set free from the illusions of the world, from the innumerable vanities and deceits with which I am surrounded. And I find in the name of Jesus the name which opens my heart and mind to reality. I believe that each one of us as an inner light, an inner guide, which will lead us through the shadows and illusions by which we are surrounded, and open our minds to the truth. It may come through poetry or art, or philosophy or science, or more commonly through the encounter with people and events day by day. Personally I find that meditation, morning and evening, every day, is the best and most direct method of getting in touch with reality. In meditation I try to let go of everything of the outer world of the senses, of the inner world of thoughts, and listen to the inner voice, the voice of the Word, which comes in the silence, in the stillness when all the activity of mind and body ceases. Then in the silence I become aware of the presence of God, and I try to keep that awareness during the day. In bus or train or travelling by air, in work or study or talking and relating to others, I try to be aware of this presence in everyone and in everything. And the Jesus prayer is what keeps me aware of that presence. So prayer for me is the practice of the presence of God in all situations, in the midst of noise and distraction of all sorts, of pain and suffering and death, as in times of peace and quiet, of joy and friendship, or prayer and silence, the presence is always there. For me the Jesus prayer is just a way of keeping in the presence of God. I find it convenient to keep in mind the four stages of prayer in the medieval tradition –lectio, meditatio, oratio, contemplatio. Lectio is reading. Most people need to prepare themselves for prayer by reading of some sort. Reading the Bible is the traditional way, but this reading is not just reading for information. It is an attentive reading, savouring the words as in reading poetry. For this reason I prefer the authorised or revised versions of the Bible, which preserve the rich, poetic tradition of the English language. Lectio is followed by meditatio. This means reflecting on one’s reading, drawing out the deeper sense and preserving in the “heart”. It is said that Mary “pondered all these things in her heart”. This is meditation in the traditional sense, bringing out the moral and symbolic meaning of the text and applying it to one’s own life. The symbolic meaning goes beyond the literal and shows all its implications for one’s own life and for the life of the Church and the world. It is a great loss when the literal meaning, of which today, of course we have a far greater knowledge, leaves no place for the deeper, richer symbolic meaning which points to the ultimate truth to which the Scripture bears witness. Meditation is naturally followed by prayer – oration. Our understanding of the deeper meaning of the text depends on our spiritual insight and this comes from prayer. Prayer is opening the heart and mind to God, that is, it is going beyond all the limited processes of the rational mind and opening the mind to the transcendent reality to which all words and thoughts are pointing. This demands devotion – that is, self-surrender. As long as we remain on the level of the rational mind, we are governed by our ego, our independent rational self. We can make use of all kinds of assistance, of commentaries and spiritual guides, but as long as the individual self remains in command we are imprisoned in the rational mind with its concepts and judgements. Only when we surrender the ego, the separate self, and turn to God, the supreme Spirit, can we receive the light which we need to understand the deeper meaning of the scriptures. This is passing from ration to intellectus, from discursive thought to intuitive insight. So we pass to contemplatio. Contemplation is the goal of all Christian life. It is knowledge by love. St Paul often prays for his disciples that they may have knowledge (gnosis) and understanding (epignosis) in the mystery of Christ. 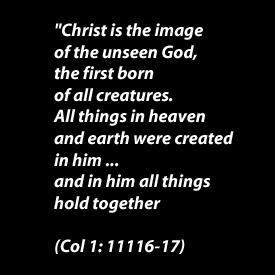 The mystery of Christ is the ultimate truth, the reality towards which all human life aspires. And this mystery is known by love. Love is going out of oneself, surrendering the self, letting the reality, the truth take over. It is not limited to any earthly object or person. It reaches out to the infinite and the eternal. This is contemplation. It is not something which we achieve for ourselves. It is something that comes when we let go. We have to abandon everything – all words, thoughts, hopes, fears, all attachments to ourselves or to any earthly thing, and let the divine mystery take possession of our lives. It feels like death and is a sort of dying. It is encountered with the darkness, the abyss, the void. It is facing nothingness – or as Augustine Bakes, the English Benedictine mystic said, it is the “union of the nothing with the Nothing”. Probably the English speaking world’s foremost teacher of Celtic Spirituality, John Philip Newell and his wife Ali and four children have devoted themselves to a new vision of reality. Newell’s shared vision resembles Father Bede’s vision and life-long devotion to returning our sacred planet to health and wholeness by assisting in the process of balance – between male and female, creation and creature, God and humanity, and the world’s religions. John Philip Newell celebrates the sacredness of the universe under the belief that everything that exists is made of God. Newell sees that an essential part of the pathway towards healing in our world is to become more deeply conscious of our brokenness, individually and collectively. Newell teaches that transformation will come in our lives and world to the extent that we choose to bear the cost of transformation. Newell’s practice of spirituality is his belief that meditative discipline and prayer serve the way of transformation. Born on May 4, 1953 in Ontario, Canada to a Christian pastor who was director of World Vision Canada, Newell was reared in the Newell family ministry. Yet, during his young adulthood John Philip made pilgrimage to India and spent time at Shantivanam. 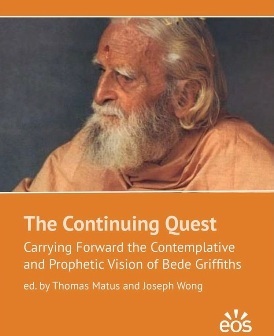 “As a young man I spent time with Bede Griffiths, an English Benedictine monk who lived most of his life in India. 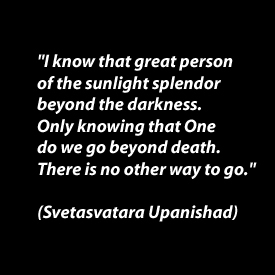 In the East, in the wisdom and meditative practices of Hinduism, he found what he called ‘the other half of his soul.’ Like the wise men, he needed to go beyond the boundaries of his homeland, beyond the boundaries of his inherited tradition, in order to see more deeply, more truly. This also was my experience in India at Bede Griffith’s ashram. On the second afternoon of my visit I awoke from a siesta in which the briefest of dreams had come to me. In the dream a beautiful young Indian woman, dressed in a sari, sat on the edge of my bed and leaning over me looked into my face and said, ‘My mother tells me that I have always loved you.’ I awoke amidst floods of tears. Sometimes when truth deeply pierces us we weep. It is as if something has been set free to flow again in our depths. Fastforward to 2013 and Newell has launched the Praying for Peace Initiative in New Mexico to nurture greater relationship between Judaism, Christianity and Islam, and in 2011 co-founded Salva Terra: A Vision Towards Earth’s Healing www.salvaterravision.org. The Bede Griffiths Trust extends our deepest gratitude to John Philip for sharing his vision that came in a dreamtime awakening so many years and miles away from Scotland, Canada, and USA where Newell leads most of his retreats, workshops and pilgrimages today. One of the things that became clear in Shantivanam during the course of 2010—a year bookended by conferences for the centenary of Swami Abhishiktananda (9-15 Jan 2010 and 14-17 Dec 2010)—was the value and increasing relevance today of Fr. Bede’s and Sw. Abhishiktananda’s work. Rather than trailing off and fading away with the passage of the decades since their deaths, what we seemed to be seeing this year and in recent years is a growing attraction to the teaching these founders imparted through their combined literary corpus and by the example of their respective monastic careers. One indication of this increased interest is simply the swelling guest ministry at the Ashram over the last couple of years. The 2010-11 season, for example, was booked throughout (and bookings for 2011-12 are filling up)—a happy problem that hasn’t been there since Bede’s time. Many who are coming are pilgrimage groups from the West. Some are Church groups, such as Patrick Woodhouse’s group from Well’s Cathedral, an annual pilgrimage made by a vital group composed largely of Anglican clergy from Wells Cathedral and surrounding dioceses. Other groups include students such as the Chigwell School which comes each February or the young Danish student group last January, among them a number of aspiring comparative religion students. Russell and Asha’s group brings forty or more each season. Doctoral students of theology and Catholic and Anglican religious are finding their way to Shantivanam in increasing numbers by way of Bede’s and Abhishiktananda’s writings. 2010-11 also saw two separate French film crews (headed by Vincent Lauth), one doing a documentary on Abhishiktananda’s life (not to be confused with the 2006-7 German film crew led by Gunter Franke) and a second, filming a documentary on Christian Ashrams for French national television (France 2). An ecumenical interfaith dialogue center of prayer in South Africa which has taken Shantivanam’s namesake (calling itself Sat Chit Anand), regularly includes in its newsletters reflections inspired by Bede’s books and Br Martin’s talks. But 2010-11 brought not only an increase in numbers at the Ashram, but seemed to engender a qualitative shift, a synergy of presence and an intensity of purpose among those gathered that was not there before. So why all this sudden interest in Shantivanam, Fr. Bede, Swami Abhishiktananda and the East-West encounter? Perhaps it is several things. To be sure the conferences last year, drawing sincere dedicated scholars, writers, priests, pundits, monks and nuns from all over the world, came as a fresh breeze inspiring we India-based participants and nudging us back to the work that had brought us down this path in the first place. It was an eye-opener and pointed to a vital dimension of Shantivanam’s growing ministry—one that is yet to be fully exploited: Shantivanam’s role as a convener, hub and headquarters for ongoing research in the East/West dialogue and the Christian Ashram experiment. But the trend of the 2010 conference year was already in place before the year began. Indeed Br. Martin’s ministry in Europe has been growing year by year in recent years and many who have the chance to see him in Europe are drawn to visit the Ashram. Camaldolese oblates from Italy and the US are learning of Bede and Shantivanam through their contacts with the Camaldolese. Cyprian’s world-wide music and teaching ministry has raised awareness about East-West dialogue and Fr Bede in remote regions of the world, and his Santa Cruz-based Bede Sangha (which recently did a benefit concert in Santa Cruz for Bless School [situated near Shantivanam]) made a pilgrimage to Shantivanam a few years ago, inspiring numerous follow-up visits by its members. The Bede Sangha in the UK and their outreach work in Tannirpalli has raised interest at home and brought their own groups to Shantivanam. The gradual dissemination of information about the mission of Shantivanam spreads with new publications, elevating Shantivanam’s profile in other countries, e.g., Shirley Du Boulay’s biographies of Bede and Abhishiktananda, Medio Media’s reprinting Bede’s books with worldwide distribution, and ongoing translation of Abhishiktananda’s writings into various languages. But if Fr Bede’s and Swami Abhishiktananda’s ideas are propagating and reaching larger audiences, still the question remains, why only now? “I think we have now reached a stage of (long-overdue) religious maturity at which it may be possible for someone to remain perfectly faithful to a Christian and Western monastic commitment, and yet to learn in depth from, say, a Buddhist or Hindu discipline and experience. I believe that some of us need to do this in order to improve the quality of our own monastic life and even to help in the task of monastic renewal which has been undertaken within the Western Church” (Asian Journals, p. 313). It is fascinating to hear how similar the stories told by pilgrims of various Christian denominations from diverse parts of the world are. What we hear each year from seekers coming to Tamil Nadu is an intense longing to explore the deeper questions of life and faith, and to heed the call of the ‘inner’ monk or nun that invariably dwells within each us. As lay monasticism continues to grow—expressed in increasing oblate membership rolls in various communities around the world, not least of all, at Shantivanam—what we see in seekers today is a sense of urgency, a healthy desperation and quiet yearning to find solid and committed faith communities engaged in the genuine search for spiritual wholeness. Where, they implore, is truth beyond the sham consumer humdrum that floods and saturates the planet’s life-world on a daily basis? Where and how in an increasingly desacralized info-saturated consumer world is one to encounter silence and the Sacred? A stream of refugees appears each year in South India, perhaps with slightly romanticized expectations as to what is to be found here and yet, with an unquestioned sincerity. What a blessing and joyful surprise it is for them to discover that not only are they not alone in their quest but that others—Fr. Bede and Sw. Abhishiktananda not least of all among them—have marked the way. 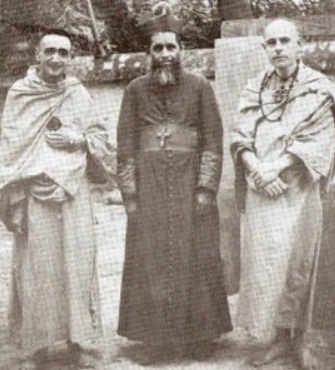 Nearly twenty years after Father Bede’s passing and almost forty years after that of Swami Abhishiktananda, the social, theological, and liturgical experiments these two monks initiated more than a half a century ago offer encouragement and orientation in an increasingly complex, centrifugal postmodern world. It is perhaps only now that the insights and ideas of these towering figures are coming into their own, finding a sympathetic listening and the broader audience they so deserve, and thus are finally attaining fulfillment in the promise of serving this and future generations of seekers and believers.